Are you planning a special event and searching for the best custom event decor in Connecticut? You may have browsed around different websites or stores but the decorations, floor graphics, and wall graphics you saw just didn’t equate to the vision you had. 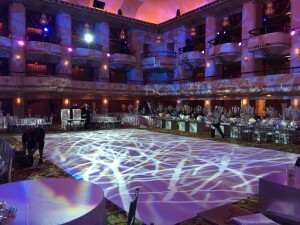 Fortunately some of the most unique designs for events, parties and weddings are custom made. At Bombshell Graphics, we can transcend whatever type of event decor you had in mind and bring it to reality! Bombshell Graphics wants to be your preferred choice for event decor and custom prints in Connecticut. Offering several different types of custom printing for special events, Bombshell Graphics places quality and care first as priorities. Not only do we at Bombshell Graphics care about our clients having the best looking event possible with high quality product, but we also genuinely care about our clients and how they are doing. The anticipation of any special even can be overwhelming, which is why our team at Bombshell Graphics dedicates time and efficiency to each project. We believe in exceeding standards and providing the most exceptional atmosphere for your event with custom dance floor graphics, custom floor stickers, wall graphics, custom prints, and more! 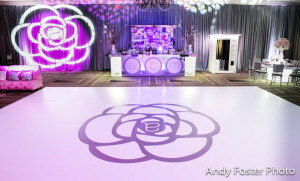 Whether you are planning a wedding, special birthday party, anniversary, reunion or dance off, Bombshell Graphics is equipped to create just about any custom dance floor graphics in Connecticut that you could dream of. With options for unique custom dance floor decal, dance floor vinyl decal and dance floor wrap, you can create the atmosphere you had in mind. While some special events may call for a ballroom or specific dance floor, others may need a basketball court layout graphic on the ground. Regardless of the type of design needed, Bombshell Graphics custom Connecticut print services wants to create the scene you prefer. Wall graphics are the perfect decoration for setting the tone of the event you are having. Whether you have a theme or specific color pattern, custom wall graphics can make your special event in Connecticut stand out from any other! Adding a wall graphic in the room at the event’s venue can create the desired impact you long for. For a wedding, you can add the special scenery you want, or add a funky pattern to match the wedding concept. Unique custom event graphics can help with creating an elegant look or funky feel. Whatever mood you are going for in the room, you get to create with the help of Bombshell Graphics. If you need graphics on podiums, floors, walls, sidings, tables, railings, or other spaces in the venue, then Bombshell Graphics is the graphic design company to turn to. From a number of different themes for parties, including fancy, artistic, candy, basketball, red carpet, and more, Bombshell Graphics loves to create unique designs to get an accurate theme across. If you need custom vinyl stickers for the venue’s ground, tables, walls or on materials, then just about any design you can imagine can be created by the team at Bombshell Graphics. The event you are hosting and decorating for should be able to be noticed upon walking in the room. If the type of decoration you require doesn’t have a theme, then the event decor should be clean, concise and enticing to excite your event guests. At Bombshell Graphics in Connecticut, we strive to create the desired look for the special even you have been planning. From elaborately themed parties to fun, eccentric events to sports gatherings, Bombshell Graphics can decorate according to your own personal preference. With the most unique custom dance floor graphics, custom floor stickers, wall graphics, custom prints, and such, we know how to truly get a party started! For all of your needs regarding event decor like custom wall and floor graphics in Connecticut, contact Bombshell Graphics today and create the event you’ve been visualizing.